16.3H, bay, elite Hanoverian stallion, 4 socks, a star and snip. Fully licensed and approved for breeding by The American Hanoverian Society. The German Hanoverian verband (AHS & VHW) Oldenburg/ISR, AWR, AWS, approved by SWANA for Swedish mares, and nominated for the International Jumper Futurity. He is also listed in the American Hanoverian Society's Jumper Breeding Program. Landkonig completed his 100 day test at Adelheidsdorf as a three-year-old and was 7th out of 50 with 118.10 points overall and a 9.5(!) for stadium jumping, 8's for willingness to work, character, temperament and the walk. Overall balanced on his jumping and rideability scores. The Hannoveraner Jahrbuch Hengste 2005 lists Landkonig with a jumping breeding value of 132 putting him ahead of Ritual, Drosselklang, Espri, Escudo II, Grosso Z and many other top German Grand Prix producers! Landkonig is in fact the highest rated jumper listed, standing in the U.S. listed in the 2009 Stallion yearbook with a jumper breed value of 135 and 140 for ability, slightly higher than super producer and 2007 stallion of the year Argentinus. Landkonig has produced, from his first foal crop, a licensed Hanoverian stallion son and in 2002 broke the record for producing the highest selling jumper ever in the history at the Hanoverian Elite auctions in Germany. Lantinus, a four-year-old gelding sold for Euro 215,000 also setting the record price for the Hanoverian auction year, something never done by a jumper! 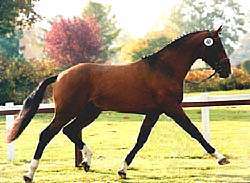 Landadel was one of the most popular and successful stallions of his generation who sadly died at a young age in 1996. Hardly a second sire deserves the label "foundation sire" as much as he does. His uniform transmission of type, nobility, color, movement and predisposition for jumping is second to none. He produced multiple licensing champion stallions, SPS mares, grand prix offspring and his presence is strongly noticed in the recent Federal and European championships. Landadel is fifth in the Hanoverian index with offspring over $30,000 earnings even though he is a Holsteiner and has earned well over $4 million in total offspring earnings. Landkonig's dam, Luna, has an evenly impressive production record. It would be hard to find a stallion with a dam line that has a stronger production record! Landkonig's Damline has produced seven licensed stallions. These sons include Grundsteins Erbe, sold to Italy for DM 450,000 as a jumper, and his full sibling, Grundsteins Erbe II, a licensed and approved dressage stallion owned by "Horses Unlimited". Others are Groenland, a breed show champion at Devon; Gratulata, a World Cup Qualifier with Michael Matz; Gina, a breeding champion of Luxemburg; her daughter winner of the Zangersheide breeding championships; Genua and Gentleman, Bundeschampionat participants. A Drosselklang filly and a stallion producing Grundstein filly from Luna sold to Paul Schokemouhle. Two offspring sold in the Vechta auction for over DM 100,000. As all these G horses are by Grundstein I, so he should be just right for your Grundstein mares. His first foal crop produced about 50 Hanoverians, several have jumped at Grand Prix level. The 2008 Hanoverian year book shows 22 placings at Grand Prix oa. Lucculus won his first Grand Prix at 7 years old, Lipton and Suus Kuyten a young Dutch rider are placing at Grand Prixs. In the US Landfall placed 3rd in the Jumper Futurity in 2007. Landkonig produced a licensed Hanoverian son and 11 of his offspring have been selected so far for the Hanoverian Elite and riding horse auctions in Verden, Germany, including Lantinus who set a record for 2002 and sold for the highest price ever achieved by a jumper at the Elite auctions in the Hanoverian Niedersachsen Halle and again a record at Shockemoehle's prestigious PSI Sale. The current owners of Lantinus, the Straumanns, paid 2.4 million dollars for him and turned down 5.5 million Euro's ($8.7million) six months later after he won the Global champions tour GP of Qatar. Lantinus has been #1 in the FEI world rank in June and July 2008 and is now at the Olympics. All this was achieved while he was only 9 years old himself and at the beginning of his breeding career. After his initial breeding seasons, Landkonig was ridden and shown by a 14-year-old girl. Even with her he had a couple thousand DM in show winnings. Anybody breeding to him is in good company as Herbert Meyer, Chef D'Equipe of the German equestrian team and K&ouml;rung judge for the Oldenburg jumping registry and others bred his best mare Gratia and several others to Landkonig. With 5 cars won and 350,000 Euro's in offspring winnings just in 2008 from Lantinus, Lipton and others Landkoenig has reached the $1 million mark in offspring winnings in 2009. La Bamba was the champion mare at the AHS/REM 2007 inspection. In 2008 three-year-old Luanja became a Hanoverian Elite Candidate by passing her performance test and was also accepted into the Jumper Breeding Program. Landkoenig is the largest producer of foals into the AHS Jumper Breeding Program to date.